PayPal and we are together for over 8 years now ! All you need is a credit card or a PayPal account. 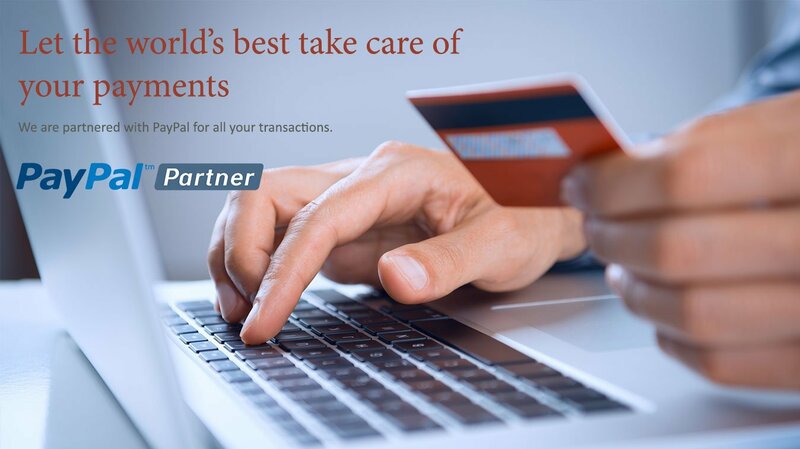 - You do not pay any transaction charges for making payments. - You make payment at the super secured transaction portal of PayPal. - Customer friendly dispute resolution facility. We DO NOT store your Credit Card/Debit Card/ PayPal information. Your payments are refundable in case you are not satisfied. Please read our FAQ section before making payment. You will receive an automated mail as soon as you have made payment. Although it is a business transaction, but for us it is more than that. It starts with your trust in us and it will last with our continuous quality delivery. We want to be your one stop trusted solution provider for all your academic needs. We thank you for starting this relationship today, and we promise that we will not let you down. Step1: Choose the currency in which the quote has been sent to you and click on ‘Pay now’ button. Step2: After clicking, you will be on PayPal secured transaction invoice page. Please write your QUOTE ESTIMATE NUMBER in the description box, enter the quoted price in the field “Item Price” and click on Update (do not forget this). Step3: If you already have a PayPal account sign-in using the same credentials on the right side of the page, else just click on “Don’t have PayPal” at the right bottom side of the page. Step4: After the credit/debit card details and the personal information have been updated in the secure PayPal portal click on “Review and Continue” button. Step7: Once the payment has been made successfully, you will receive a mail from PayPal with all the transaction details. You need not do anything after that. We will also be intimating you with payment received mail. This may take us some time. We accept all the popular credit cards. You can also pay us if you have a PayPal account. However we do not accept money transfer through bank transfers or western union money transfer. Is my credit card information secured with you guys ? Yes, 100%. To make the payment process smooth and secured, we have partnered with the most popular and trusted payment partners, PayPal. Your payments are processed on PayPal’s secured transaction portal. This essentially means that we do not store any information about your credit card. We have a 100% money refund policy. However, the refund is processed after a detailed scrutiny of the order. If we are not able to meet the deliverables defined at the time of payment, then we shall be refunding your money via PayPal. This decision is made by the management of AssignmentEssayHelp.com and would be final.